Here at the hotel we pride our selves with the personal touch with our guests, being there for them every step of the way through out their holiday so we can make it a memorable one, weather it is a family holiday, a romantic getaway, or simply relaxing away from the busy urban life. Our spa facilities are here to take the tension from everyday life , with a huge variety of spa treatments and massages. Elegant Hotell is situated in the very heart of Bansko, close to the Ski gondola, restaurants, bars, and the shopping street only 200 m away. The Hotel has a spa center, Jacuzzi, sauna, indoor swimming pool, fitness area, a massage facility, a childrens playground, and lots more activities like hiking, rafting, MTB, ATV motocross, jeep safaris, etc. Our international staff speaks several languages like English, Bulgarian, Macedonian, Serbian, Turkish, Russian, Croatian, so there is a good chance we speak the same language, and therefore we are always here to tend to our guests needs and requirement and make their stay as pleasant as possible. The Hotel has no restrictions and is open for families with children of all age. Reception is at your disposal 24/7, as well as the lobby bar. 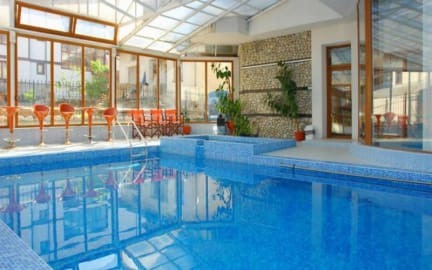 The Hotels indoor premises are smoke free environment.